While there has been a lot going on in Chicago and with Chicago's public schools during the last weeks of July and the first week of August 2013, Substance reporters and editors have devoted more than 100 hours to reporting, editing, and illustrating the legal wrangling in one case: The lawsuit filed by parents charging that Chicago Public Schools is violating the Americans with Disabilities Act (ADA) and the rights of the more than 2,000 children with disabilities who were attending school in the schools that the Board of Education voted to close at its May 22, 2013 meeting. 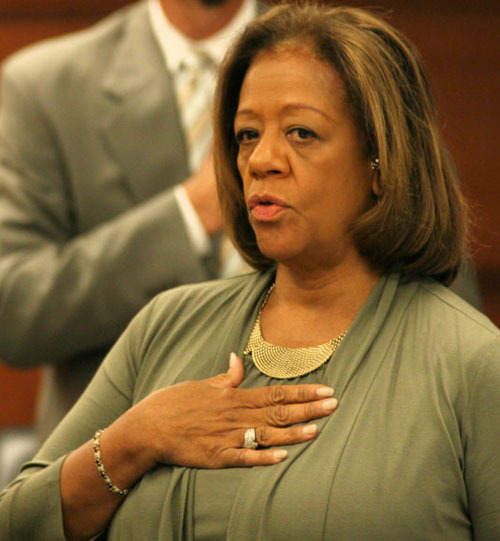 The current "Chief Executive Officer" of Chicago's public schools, Barbara Byrd Bennett, left Detroit less than 18 months ago, but was hired in March 2012 to be Chicago's "Chief Education Officer" following her work to destroy public education in Detroit. In October 2012, she was promoted by a vote of the Chicago Board of Education to the title of "Chief Executive Officer" at an annual salary of a quarter million dollars a year during a year when CPS claimed it was facing a "billion dollar deficit." On October 24, 2012, the seven members of the Chicago school board also voted, without public discussion or debate, to pay Byrd Bennett $30,000 in "relocation expenses." Since then, the Board members have voted, each month, to keep secret the record of the discussions they have during "executive session." Substance photo July 24, 2013, by David Vance.Compared with the paltry paragraphs published elsewhere in Chicago's press, the Substance coverage is either overdoing it or performing a service that our brothers and sisters in the media should also be providing. Obviously, we think the latter, and we think that after our readers take the time to read both the Plaintiff and Defendant reports on the lawsuit readers with agree with us. Then it's time to ask "WTF!!??" about how Chicago learns its "news" in the era of corporate "school reform." And that "WTF!!??" should not be directed at Substance, but at the Chicago Tribune, Chicago Sun-Times, Catalyst, and the radio and TV news people -- and their owners and editors. The contrast between the cynical version of reality practiced by CPS -- in the face of one of the most important federal laws of the past 100 years -- and the requirements of both the law and simple decency is as stark as can be. But that contrast can only be fully appreciated after readers take the time to read both reports by Susan Zupan from those lengthy days of trial in the federal courtroom of Judge Lee. Already those who have been supporting the litigation -- and opposing the closings -- have a lot to be proud of. Rarely does a case in federal court have to provide an "overflow room" so that all those who are entitled by law to attend the proceedings can do so. Although we compared that to the practice of CPS in providing a "holding room" to the "public" during Board meetings, that's unfair to the federal court. At Board meetings, the action on the fifth floor is censored before it reaches the 15th floor (where the holding room is located at CPS headquarters at 125 S. Clark St.). In the federal court, those in both the main courtroom and in the overflow room saw and heard every minute, every lie and evasion by CPS officials, and every futile attempt by the expensive lawyers for CPS to trip up the case being made by the lawyers for those disabled children and the Chicago Teachers Union. But before we comment further, we are hoping that this weekend many of our readers will be able to find the time to read the entire report ("Plaintiffs' case" and "Defendants' case") by Susan Zupan here, and then begin the commentary here and elsewhere on what we are witnessing this summer.